Hello this is the Scottish Bonsai Association Presidents Page where I will spout forth on a regular basis, so if you have any issues or questions that you want answers on then drop me a line. Don't hide your light under a bushel - if you have a suggestion let me know - if you want to complain, let me know again and, if you have a question then send it to me and we will see if we can tap the expertise of the whole body of bonsai expertise to answer it. It’s early March so things are beginning to move on the bonsai front. 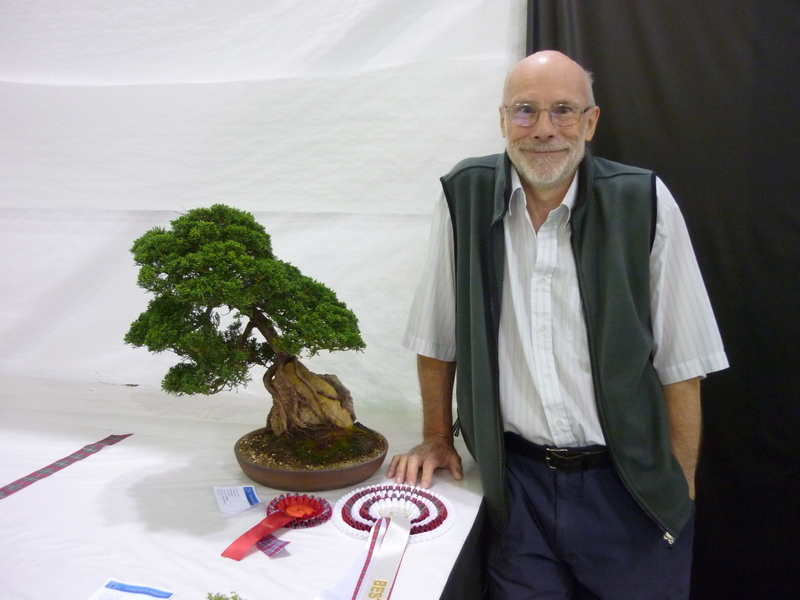 At the Ayrshire Group meeting on Sunday, we had the privilege of welcoming Peter Snart to the club to talk about key aspects of bonsai design, focussing especially on deadwood and how to incorporate this into realistic design. As many will know, Peter is the owner of Willowbog Bonsai Nursery near Hexham in England and had battled his way through some pretty bad weather conditions to provide us with the benefit of his nearly 40 years’ experience in the hobby. Peter’s nursery has played host to workshops and seminars by some of the biggest names in Europe (and in some cases the world!) so has gleaned a vast wealth of knowledge over the years which the club members were only too eager to share. The session was well worth the wait with Peter’s enthusiasm and expertise shining through and generating a lot of interested response. After the presentation Peter also took the time to discuss several of the member’s trees with them individually providing helpful input on the next steps in their development. In the meantime, there was plenty of other discussion and activity going on with several re-potting exercises taking place. Also, a retired ex-club member had donated some trees and pots which were eagerly snapped up by some of the members to expand their collections. All in all it was a great day with about 25 members taking part, including some new ones resulting from the recent Winter Image and Dobbies events. Our thanks to Peter for making the effort to come and help us. The Royal Caledonian Horticultural Society (known as “The Caley”) was established in 1809 to encourage improvement in all aspects of horticultural activity. 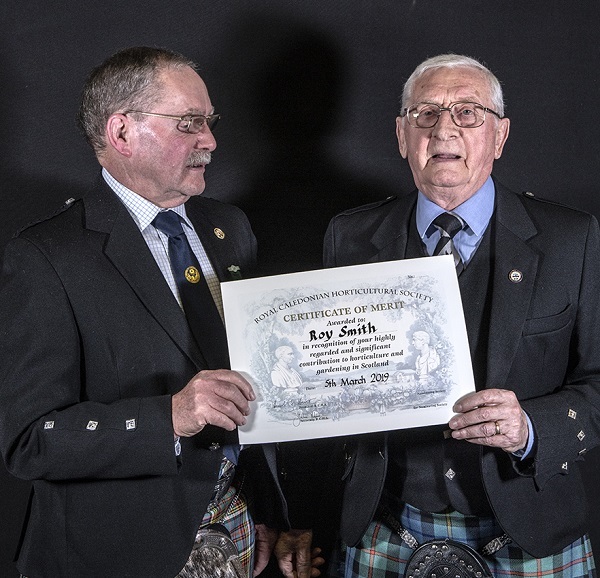 At their AGM this week Roy Smith received the award of their Certificate of Merit for his long, varied and outstanding contribution to, and promotion of, bonsai in Scotland. As a member of Forth Valley Bonsai Club, former, long-serving secretary of the Scottish Bonsai Association and Trustee of The Scottish Bonsai Collection Trust, Roy is so well-known and well-respected throughout the Bonsai scene in Scotland where many fellow bonsaists have benefitted from his help and advice over the years. Congratulations to Roy on this very appropriate recognition. See the picture of Roy receiving his award from George Anderson, Honorary President of The Caley. This year’s National Exhibition returns to Troon Walker and Concert Halls on Sunday 5th May. We very much want to make this event a landmark occasion for the hobby in Scotland and have invested significantly to make it a success. We are also advertising the event widely and hope to bring in members of the general public in significant numbers. 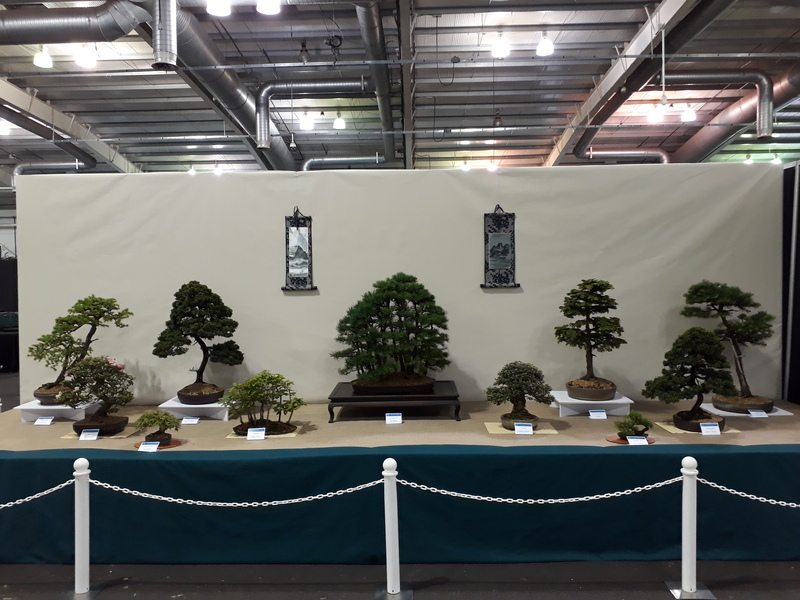 All it needs now is the support of members to come along, exhibit their trees both on the club stands and as individuals in the open section, and join in this one and only national event in Scotland dedicated solely to bonsai. The display “slots” will be available in two standard widths – 80 cms. and 60 cms. Exhibitors may arrange their trees within the agreed space in any way they choose. For example two slots could be booked and populated by 3 trees or by a single large shohin display. The tree type(s) to be displayed (e.g. Arakawa Maple, European Larch etc.) and also indicate if they are to be entered as shohin. The name of the pot maker (e.g. Chinese, Japanese, John Pitt, Unknown etc). This information should be submitted before 14th April 2019 (the earlier the better) after which the requests will be checked against the available space and positions allocated in the display. Each tree will then be given a number which will identify its position in the display and this will be communicated to the exhibitor by April 30. A card with the exhibit number and details will be prepared in advance and, on the day, placed in the allocated space so the exhibitor knows where to position their trees. All exhibits (including accents) should be displayed on stands/mats in order to protect the stand material and any scrolls, accents should be free standing as they cannot be hung from the backcloth). Given the limited set-up time for this event it is critical that everybody understands and sticks to the process outlined – especially the cut-off dates for slot bookings. If anything is unclear please check with your convener or contact Jeff Banning via president@scottishbonsai.org or direct on 07799477895. By now I hope that you are all aware of the Corin Tomlinson event on Saturday 30th March at the Smith Museum & Art Gallery in Stirling and are busy buying tickets from your respective conveners. It's really imporatnt that we continue to provide different perspectives that experts from outside Scotland can bring so I trust that members will take advantage of the opportunity to participate in what will be an informative and entertaining day. Recently I fell in love ………… with the bark of the Portuguese Oak (Quercus Faginea) and decided that I had to have one. But I needed to move quickly as their importation has recently been banned by the government. So I approached the only dealer I knew who might still have some in stock – Kaizen Bonsai. Graham Potter was really exceptionally helpful explaining that, in order to obtain medium sized trees with old bark, this often meant an air layer. So much of what he had in stock were the remaining stumps of such operations. Graham sent me pictures of several such “stumps” along with a picture of the one “non-stump” in my size range, which I eventually bought (after much soul searching about the price !). However, my interest obviously awakened something in Graham who, it seems, set to to develop one of the stumps I had rejected in the way only he can – and I thought that members may be interested in the transformation. It’s a real work of art in my view – see what you think. Thanks to the 32 members who attended the recent AGM meeting at Denny. It appeared that some mebers just attended for teh boot sale and left before the AGM so actual overall attendees were somewhat higher - although we have npo record. Particular thanks to Peter Thorne and Lex Kennedy who volunteered to take up the positions of Treasurer and Secretary respectively. Without these volunteers the organisation would not be viable and the benefits derived would disappear so, again, many thanks to them. Thanks also to teh outgoing Secretary (Dave Waddington) and Tresurer (Dave Hynd) who have done a sterling job during their term. The concurrent boot sale produced a good array of bonsai items for sale and activity was pretty brisk. I hope all purchasers are happy with their buys and derive much enjoyment from them. The next event in the bonsai vcalendar will be the Winter Image Event staged by teh Ayrshire Group on Sunday 13th January. So please keep a note in your diary and take along a tree in its winter garb. This year, I am continuing the convention, of circulating the President’s Report in advance so that members have time to digest the content and come up with any resulting questions or issues that they wish to raise at the AGM. Throughout my 3 year term my objectives have been to support the constitutional goals of the Association, while at the same time striving “to support the members of the Association in enhancing their knowledge, skills and experiences in and of the hobby using the resources of the Association in a direct and meaningful way to achieve this”. 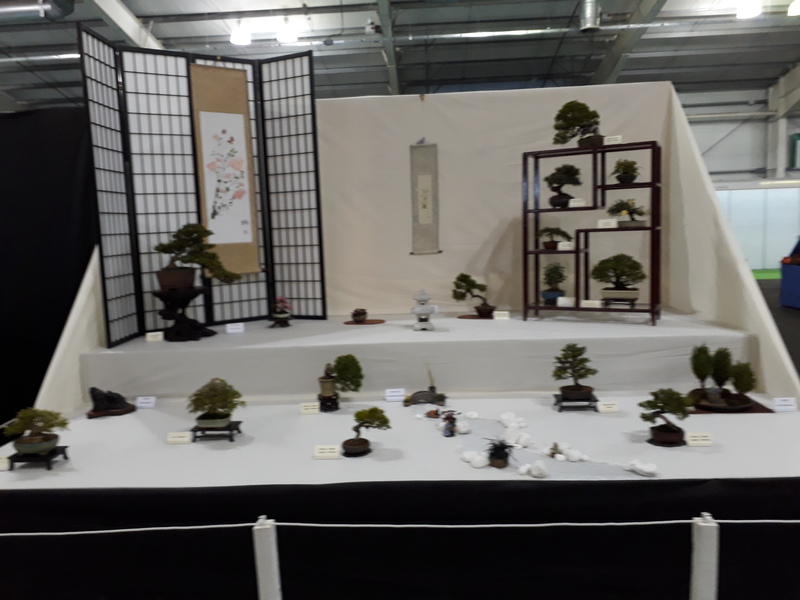 The 2018 National Exhibition (hosted by the Ayrshire Group) took on a new dimension with the addition of a traditional bonsai display format in addition to the usual club displays. It was disappointing that two of the clubs were unable to mount club displays this year but the new format allowed members to display individual trees in addition to the option of contributing to the club stand. This added substance to the show and appeared to be well received by both members and visitors alike. The show will be held in Troon again next year and we will be looking to develop the format further. 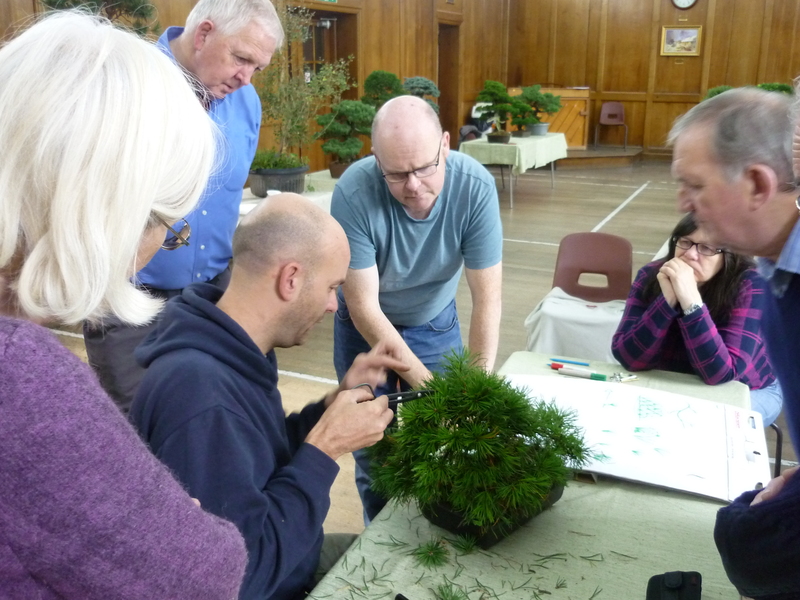 The Association again sponsored a seminar/workshop visit this time by Corin Tomlinson of Greenwood Bonsai. Member feedback has been very positive about this but nevertheless there was insufficient demand to support more than one workshop compared to the two workshops last year. The Committee is seeking the views of members about a format next year and in the meantime is investigating the availability of potential guest speakers. The SBA again put in an outstanding performance at Gardening Scotland winning two gold medals, alongside the gold for the SBCT stand. However, it may be that more discussion with the public is generated by the SBA competition stands. The Committee is already holding initial discussions on how to improve next year but there will be a need for more stewarding help from individual members as this was one area where we struggled this year. A big thank you is due to all those who helped with set-up and stewarding this year. 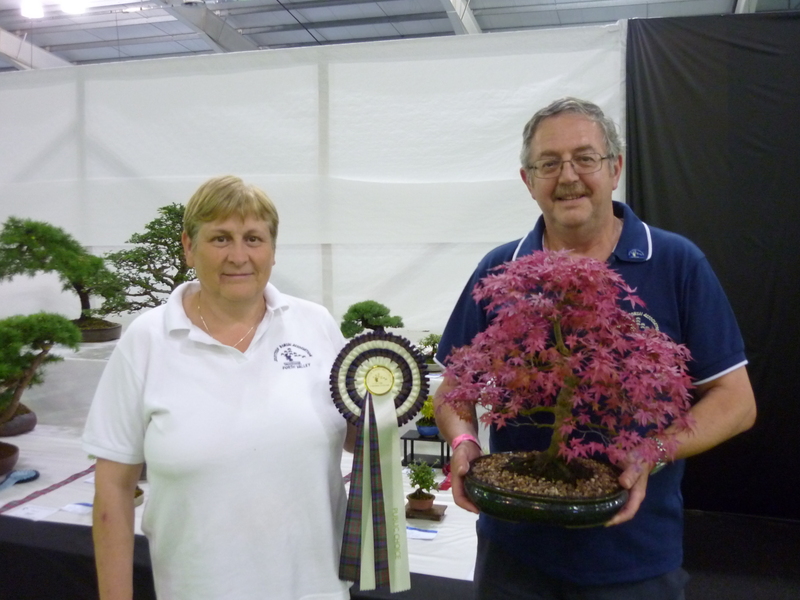 The SBA supported members from several groups attending the prestigious Bonsai Europa show in Bury last October. Some had trees accepted for display at the show, whilst one member was also invited to join the judging panel. The Ayrshire group once again hosted a winter image show in January, and particularly welcomed any SBA member with a tree for display, as well as those who came to view. The event will take place again in 2019 on Sunday the 13th of January. 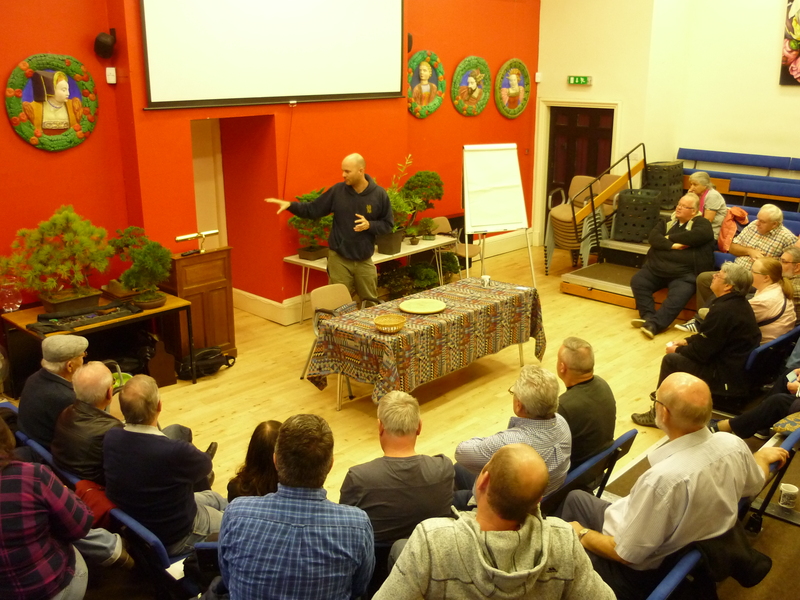 The Forth Valley group ran their regular May weekend open workshop, with Ian McDougall, which has contributed to the development of many SBA members from several groups over the years. Further investment was made in stands and backdrops to enable the extended display format at the National Exhibition and this equipment is available to all of the member clubs if they wish to use for local events or displays. A new data protection policy has been published to all members ensuring that they know what information about them is retained by the organisation and how it is used. This should make us compliant with recent legislation on the subject. Particular thanks to Alan Coupar for his meticulous work on this aspect. All these things have been achieved without inflicting significant damage to SBA funds. Despite the Committee’s best efforts in providing club grants, supporting events financially and investing in equipment we are not eating into the financial reserves of the Association. Further suggestions are needed from individual members on how they would like to see SBA funds used to support SBA goals either nationally or at individual group level. All of those who contributed to and supported these efforts are to be commended. A lot of work goes on behind the scenes in terms of planning and organising and those involved devote a lot of their own time to making sure the efforts are successful. I would like to thank all those who donated blood, sweat and tears to make them a success. I would also like to express my thanks to the other Committee members who have provided much needed, and valued, guidance and support throughout the year. It seems possible that some of these efforts are paying off to some degree as membership, which has been static at about 140 for a couple of years appears to have increased to 156. So, I would like to take the opportunity to welcome all individual members who have joined the Association in 2017/18. We welcome you and the input that you bring. However, membership improvement appears not to be across the board which suggests that we may need to focus some activity a bit more where membership is not so strong. Finally, you will be aware that both the Secretary and Treasurer have decided to stand down this year. I would like to recognise and thank them for the additional effort and commitment that these roles require. I would propose, in the interests of continuity, to continue a further year as President (if approved by the members) but it will be critical that these two positions are filled if the SBA IS to continue as a functioning organisation. I hope that all members will seriously consider this before the AGM since, if we cannot fill these positions., we will return to the position we were in three years ago where the future of the organisation is in jeopardy. In summary the organisation is in a strong position with substantial and stable finances and increased membership. However, we cannot rest on our laurels or take this position for granted. As a member focussed organisation the challenge for us as individuals is to make whatever contribution we can to ensure the Association in meets members aspirations. We need members ideas and support as to how the Associations resources may be best used for the benefit of all. 2019 marks the 40th anniversary of the establishment of the Scottish Bonsai Association. I hope that, with your help, we can make further progress to mark this important milestone. 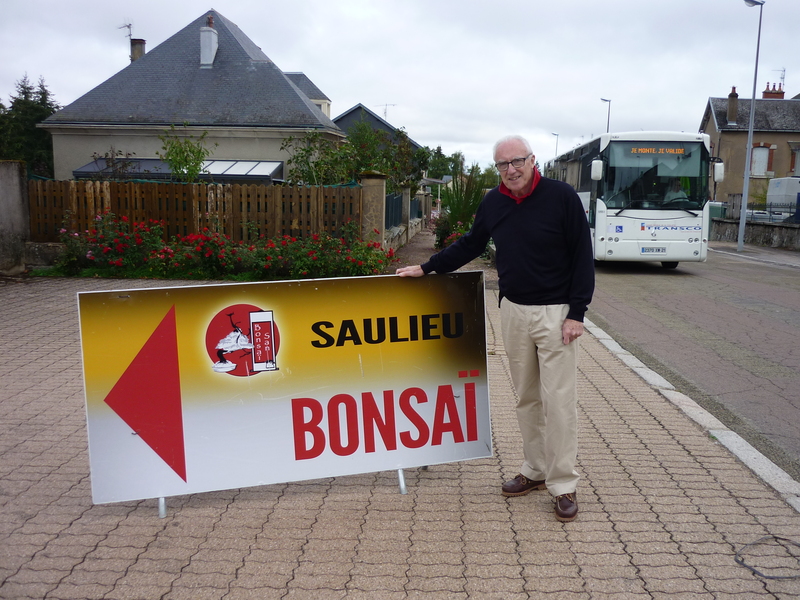 A bit of a time gap but just a quick update on my recent trip to the European Bonsai-san Show in Saulieu (France) last week-end). 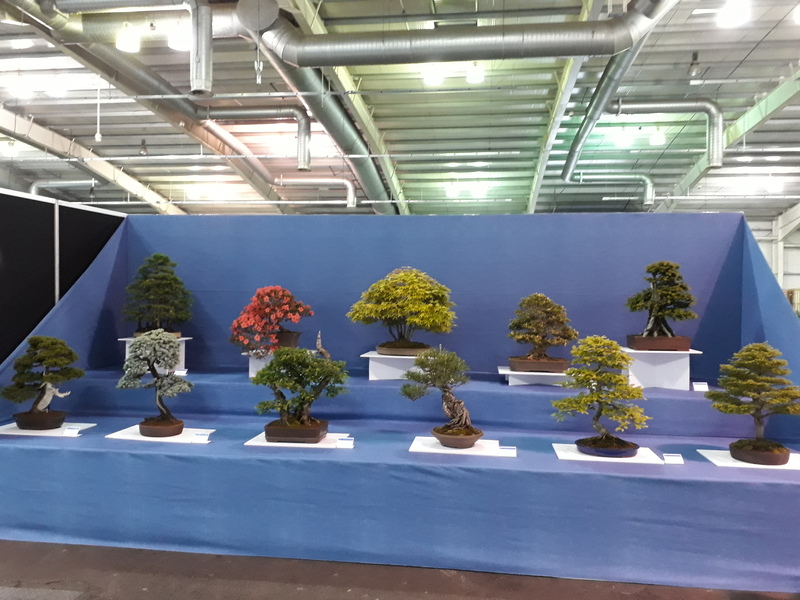 This was two day show and the biggest I have been to so far - a realk treat with dealers of all things bonsai from both Europe and Japan. Just to prove I was there. Last weekend I took a trip over to Northern Ireland for a family wedding but no trip would be complete without incorporating a bonsai visit and I was in luck because Ian Young alias the “Bonsai Eejit” happened to be home and he invited me around to take a look at his collection and to talk bonsai. Ian is a well known blogger (www.bonsaieejit.com) who is rapidly developing an extensive reputation across the whole of Ireland as a motivating force for many clubs and also as an provider of both group and 1:1 tuition. 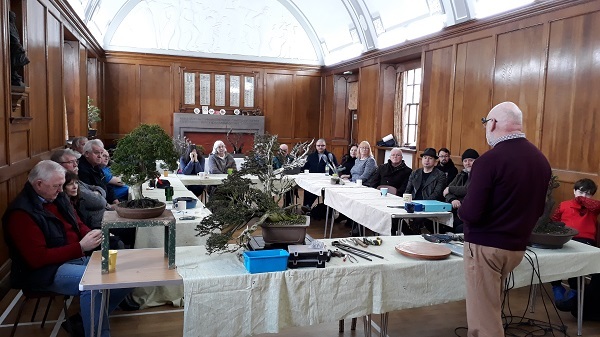 He also delivers presentations and the Ayrshire Club had him over in March last year when he led a very interesting discussion about bonsai styling. 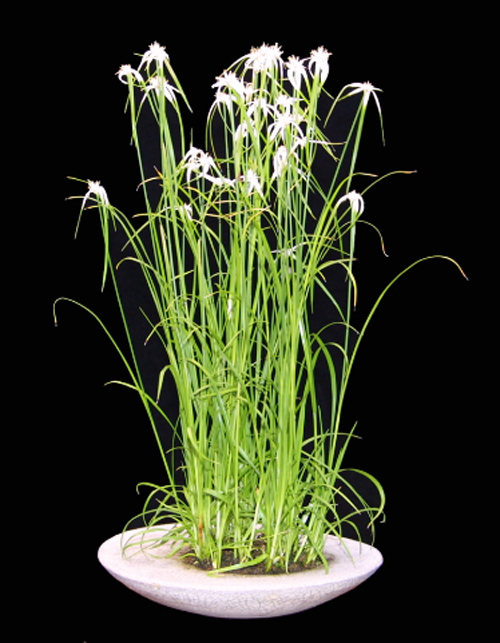 Ian also has a keen interest and expertise in accent plants, of which he has a wide selection. Ian’s enthusiasm for the hobby is infectious and it’s no surprise that he has been instrumental in generating so much interest in the hobby in Ireland. He is also a keen student of the hobby and has spent time at both Saruyama Bonsai (with Peter Warren) and at Bonsai Mirai (with Ryan Neil). His blog is a great source of bonsai contacts, articles and videos and is well worth a visit. The time flew by as we discussed many aspects of the hobby and many of the stories behind Ian’s trees. However, I reluctantly had to respond to the stream of texts starting to arrive from my wife enquiring if I had got lost and leave Ian to make the arrangements for his latest seven-day tuition trip around the island. A most enjoyable few hours of interesting chat and warm Irish hospitality. Thanks Ian. Gardening SCotland is over for another year and as all the volunteers who supported the show collapse in a state of mental and pjhysical exhaustion I just wanted to post a few photos of the key prize-winners. This one shows from left to right : Consul's choice (John Morris), Best in Show (Dave Waddington) and Reserve Best in Show (Ian Downie). Well done all. Hopefully more and better quality pictures will arrive, courtesy of teh more skilled members. Please send to president@scottishbonsai.org. Also we hope to publish pictures of all those placed in each of teh competitive sections - watch this space. Here are some initial snaps taken during the calm before the storm - hopefully some good photos will follow - I am relying on members to contribute ! Just a quick update to let you know the results of teh members voting at the National Exhibition. These can be viewed in the attached file. WE had approximatly 125 members of the public visit the show during the day (significantly higher than previous shows) and by their vote Ian McDougall was successful in the Open Section and Alex Harrison on the Club Display. On Sunday May 6th the Scottish Bonsai Association held its annual National Exhibition in the Walker and Concert Halls in Troon. A big effort had been made this year to expand both the content and the interest of the general public. 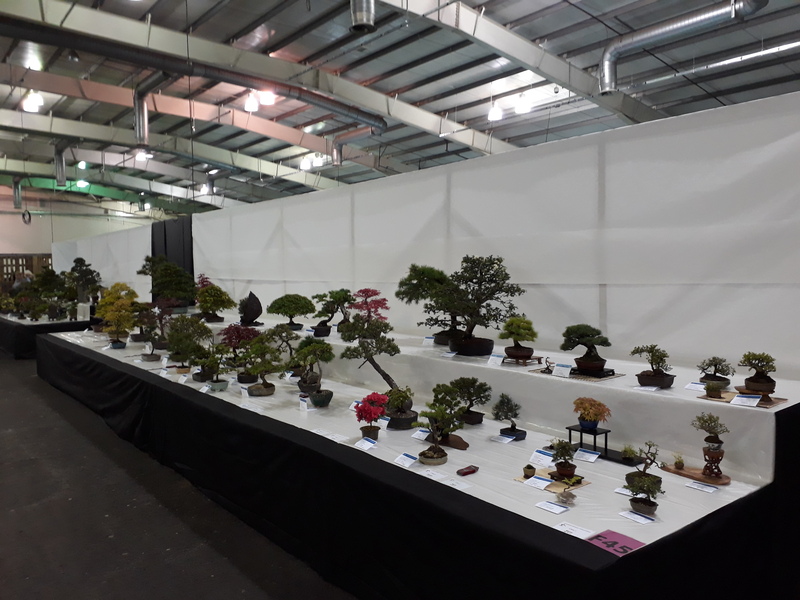 We certainly succeeeded in the former to the extent that we could justify our claim that this represented the biggest exhibition dedicated soley to bonsai yet seen in Scotland. Public attendance was also very good although the numbers on that are still being crunched as we speak. My thanks to all who came, to those who exhibited trees (esecially our long-distance guests Ray Coulomb and Mike Box from Carlisle) and to our traders . Last, but far from least, thanks to Ernie's merry band of caterers who provided us with great sustenace throught the day. Just back from a very interesting trip to Japan and have shared some of my photos on Facebook page in case anyone is interested. The purpose of the visit was not solely to view bonsai but I did manage to incorporate a few viewings during my stay. First was a visit to Omiya Bonsai Village near Tokyo. This is the home of the Omiya Bonsai Art Museum housing many impressive examples of bonsai and also is the location for several bonsai nurseries. The route from the station to the museum is indicated by ceramic inlays in the pavement which is what you will see in one of the phots. The nurseries do request no photographs and the museum only allows photographing in a restricted section so the examples that I have posted are relatively few – and not necessarily the best examples – but they do give an idea of the standard. In the middle I visited the Koju-En bonsai nursery in Kyoto. This specialises in shohin trees and is owned and run by Tomohiro Masumi who also happens to be Chairman of the All Japan Shohin Bonsai Association. He very kindly let me browse his trees for a couple of hours and also to take a few phots (you will see a shot of him and I in the photo selection). He was extremely friendly and his English was pretty good so he was able to help me with the many questions I had. And lastly – on our last day in Japan – Helen and I visited the Botanic Gardens in Kyoto where they have a display of bonsai all out on benches – with no security ! Throughout our stay we visited several Japanese gardens around temples and former palaces and what struck me most was the architectural nature of the trees in the grounds. These tended to be full size trees, in the ground, but styled like bonsai. You will see a few examples in the pictures and even some where the local gardeners where de-candling some over-size pines. Overall a very enjoyable visit (if you forget about the food !) and to be recommended. Just seeing the trees is an educational as well as an enjoyable experience. PS : I have thrown in a few “tourist shots” just to prove that I am not bonsai obsessed ! 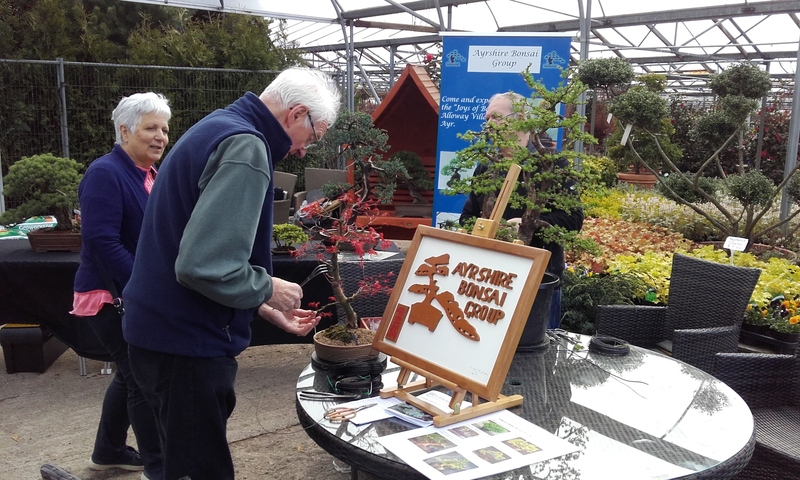 In what is rapidly turning into an annual event the Alloway based Ayrshire Bonsai Club took to the road in April for a week-end display at McLarens Nursery in Uplawmoor. 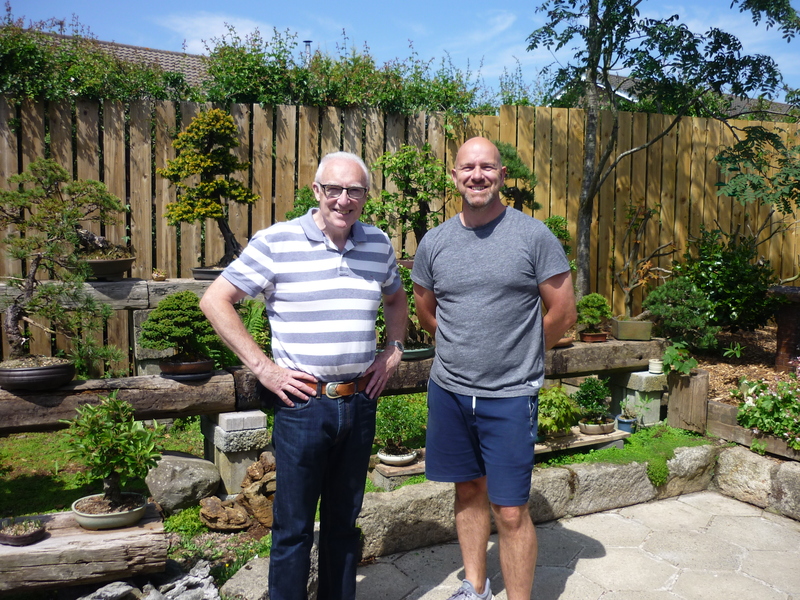 The Ayrshire club is committed to promoting the hobby wherever it can and this visit was intended to demonstrate how ordinary, nursery-bought trees can be transformed and styled as bonsai in a relatively short time. Also, the club is always on the look-out for new members so this is a good way of making the hobby more visible and perhaps sparking some permanent interest. The display attracted a lot of attention and many visitors stopped to chat and find out more about the hobby from one of the ten club members who turned up to show and discuss their trees and also to pass on some of their extensive knowledge. Of course bonsai enthusiast like nothing better than to “talk bonsai” and the level of interest from the general public is always surprisingly high. However, when it comes to taking up the interest as a hobby many people are wary of the time, patience and expertise required, so it was good to engage with people and let them know that these fears are ill-founded. The members will get another chance to promote the hobby at the Scottish Bonsai Associations National Exhibition in Troon in early May - looking forward to it ! A coiuple of snapshots of the event. If you, like me, have often wondered about the design process for raw material and you haven't seen this video by Ryan Neil , then you just have to watch it. In it he shows how to take a basic nursery specimen and create the initial styling talking through all the stages and explaining each one very clearly and in detail. Along the way there are all sorts of little gems of explanation and guidance. As usual from Ryan Neil it's an excellent guide filled with quality information and seething with his infectious enthusiuasm. It's a longish watch - about 90 minutes, but well, well worth it. I hope you enjoy it as much as I did. Following on from my previous note I am pleased to let members know that the Finnis Scott Foundation has agreed to provide a grant towards the cost of staging the SBA National Exhibition on May 6th. This is particularly welcome as the SBA is making a real attempt to expand the scope of the exhibition and to attract more interest from the general public. The Finnis Scott Foundation was established under the will of Lady Montague Douglas Scott in 2006. The trustees are able to make grants for any charitable purpose, but their present policy is to focus grant-making in the areas of horticulture and plant sciences, as well as fine art and art history. In providing a grant in support of bonsai development in Scotland the trust recognises the unique horticultural and artistic combination that the hobby brings to the table and we thank them for their support. Even more reason to make a special effort to ensure that the show refelcts the best that Scotland has to offer in the way of bonsai trees! 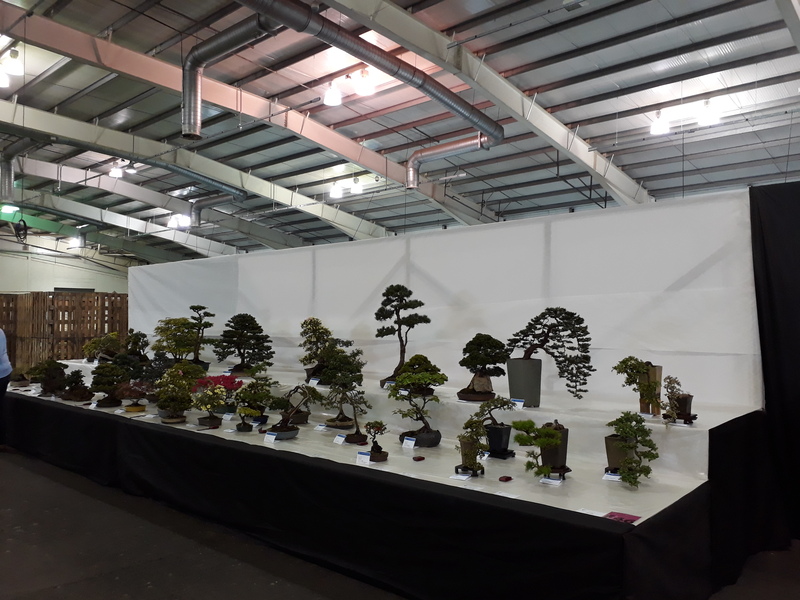 As members probably know, the Scottish National Bonsai Exhibition is scheduled to be held on Sunday 6th May in Troon and, as we have started to discuss the arrangements I thought that it would be a good idea to issue regular updates so that members can plan ahead as much as possible. This year we need member’s support more than ever as we have taken the decision to expand the number of exhibits that we can accommodate and to do this within a slightly different structure. In addition to the normal club displays, which will remain as they have traditionally been, we will be making provision for people to exhibit an individual tree (or trees) in a tokanoma style format. This means that we will have 4 rows of 6 trestle tables, each separated by backdrops, to accommodate individual trees or compositions. That means that we can accommodate something between 25 and 40 trees depending on their size. We recognise that many members are happy with the normal club display approach and that not everyone will want to contribute to a single tree display. However, we also recognise that some members may have trees that they want to show but which would not necessarily make the club display because of space restrictions. It is an experiment for us and one which we think is worth a try. This is where we will need your help. Because we need to plan out the tokanoma spaces we will need to know people’s requirements in advance. Which means that we will need to know how many individual trees people will want to display and their approximate sizes. We will advise when that information is required but for now I wanted to give everyone a heads-up on what we plan so that they can start to think about what they would like to show and to prepare their trees accordingly. I understand that there will always be concerns about knowing in advance what tree will be showable but other shows wrestle with the same problems and still seem to be able to make it work, so hopefully we can give this a good try. This is a bit of a risk for us and a significant investment for the SBA, so it would be embarrassing if we end up with very a large amount of empty display space. We do need your support this year to test the idea and identify how we can improve the exhibition next year and beyond. So, please think about what you might wish to do, discuss it with your Convener and be prepared submit details when we ask for them (probably in week 1 April). Yesterday was the annual Winter Image event hosted by the Ayrshire Club. This was a great opportunity to show off the real work that has been done over the years on branch structure and ramification before foliage starts to provide a new image in the spring. Many thanks to all those who attended from as far away as Carlisle, Edinburgh, Inverurie and North Lanark and who were happy to share their knowledge and expertise - in return for a slap-up feed ! We really appreciate your support. The next big event will be the SBA National Exhibition in Troon on Sunday May 6th. Mark it in your calendar and look out here for further details. In the meantime, some photos are available on our Facebook page. I had to share this amazing picture spotted on the Old Lads of Wirral Bonsai Facebook page. Just had Peter Warren visit for a week-end of demonstration and workshops - great time was had by all and the feedback has been excellent. Thanks Peter and thanks to all who attended and supported. PLease don't forget that we have Peter Warren visiting us in September. On the 16th he will host a seminar/presenmtation at the Smith Art Gallery & Museum in Stirling between 10.30 and 17.00. Please come with trees to review - problem trees are just as welcome as any other! A soup and sandwich lunch is included in the ticket price of £15. See your convener for details. On the 17th Peter will conduct a workshop in Ayr and on Monday he will conduct a workshop in Currie. There is no doubt that the hobby punches well above its weight at Gardening Scotland with successful displays plus significant competition entries. Congratulations to all involved and many thanks to the many helpers who turned up to support and steward the event. Today a small group (just 3 actually) of myself, Maurice Maidment and Jim Conlin staged a 2 table display of bonsai trees at the 200th anniversary of the Glasgow Botanic Gardens. As this was staged in a public space with no entry fees it was extremely busy and the odd shower meant that we had regular surges of inquisitive visitors to the stand. This turned out to be a very useful event with many people stopping to admire the trees and ask lots of questions about the hobby. There are no prizes for guessing the most frequent question (how old etc. etc) or the most frequent confession (I had a bonsai once but ... etc etc.). However there was enough interest to strengthen my view that Glasgow could support a bonsai club at the right venue and with the right central SBA support. I collected several email addresses of people who would like to be kept informed and I also spoke to Ewan Donaldson (general manager) who was supportive about a venue. I think that this is worth following up but it will need initial financial support from the centre and it will need support from members to get any new group off the ground. I will report back to the Committee at our meeting next Wednesday and we will see how we go from there. Please, let me know your views - or , even better, how you could help with an initiative like this. In the meantime many thanks to Maurice and Jim for setting aside the day to evangalise the hobby. 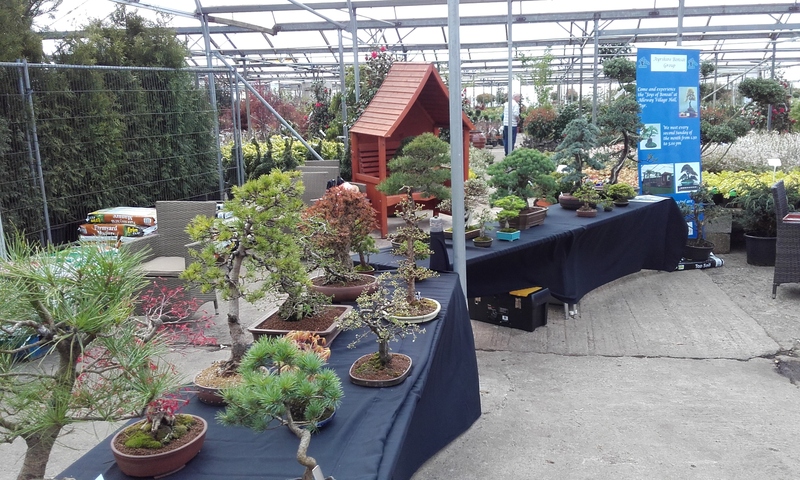 Members of the Ayrshire Bonsai group will be staging a public display and demonstration of the art and craft of Bonsai at Mclarens Nurseries, near Barrhead, between 10and 4pm on Saturday the 29th April. As a bonus to SBA members, the Ayrshire group have managed to negotiate a 10% discount on the retail price of any plant material purchased on the day. To benefit from the discounted price, SBA members are simply required to exhibit a current SBA membership card at the time of purchase. Please find the time to support the event and join us on the day. For those who have not been to McLarens it is a huge commercial nursery with lots of trees suitable for development as bonsai at reasonable prices - so why not go along and take a look. Getting ready for Gardening Scotland ? - if you want a spare entry form you can just download here. Volunteers are needed at Gardening Scotland for preparing, arranging and supervising stands. Tuesday May 30th From 2pm onwards to help our experts as needed and to dress supplied SBA competition stands. We cover them with rolls of paper and plastic. Not heavy work, but slow if not enough folk, new volunteers welcome. The 3 main “show” stands are also done. Come for a spell in the afternoon, or into the evening if you have the time. Wednesday May 31st Please bring trees to help fill stands for the competition classes from 10am-7.30pm. Trees, and members, at all stages of development are welcome. There may be work on stands unfinished on Tuesday, and also to help with receiving trees, and provisionally laying them out later in the day. Friday June 1st - Sunday June 3rd Supervising stands, which involves talking to members of the public and answering their questions (can be fun!). Usually work in 2-3 hour shifts between 10am and 5pm. Members helping to supervise will get a free day ticket for Gardening Scotland. Please let Dave know if you will be available to help, indicating which day & time suits you best. I have been musing about original bonsai displays and came across this crowdfunding request for floating bonsai ! Only works for very small trees though - still, an interesting idea. See the latest list of UK and worldwide bonsai events. I see no mention of any Scottish events so will send the info to see if they will include. Given that "exhibition season" is rapidly approaching I thought that some of you may be interested in this hour long video of Ryan Neil carrying out a critique of trees in the Michigan All State Bonsai Show. Some of the trees are US specific but nevertheless I found that there were plenty of ideas and pointers that I learned from - hoopefully you will too ! Of course you always have the ability to respond or comment on the post - which would be great. So - Robert Nocher is off the mark with his re-potting this year ! See the attached post on his website for some encouragement for those who need it !! Following on from the 7th FEbruary post about re-potting, you may want to take a look at this article by Peter Warren on potting mediums (if you haven't already seen it) . Here is the latest bonsai calendar of events for UK and worldwide. The one you may wish to note is the Bonsai Traders Fair in Coventry on April 23rd. Spring is getting closer and the more impatient amongst you will be champing at the bit to get started on your re-potting. 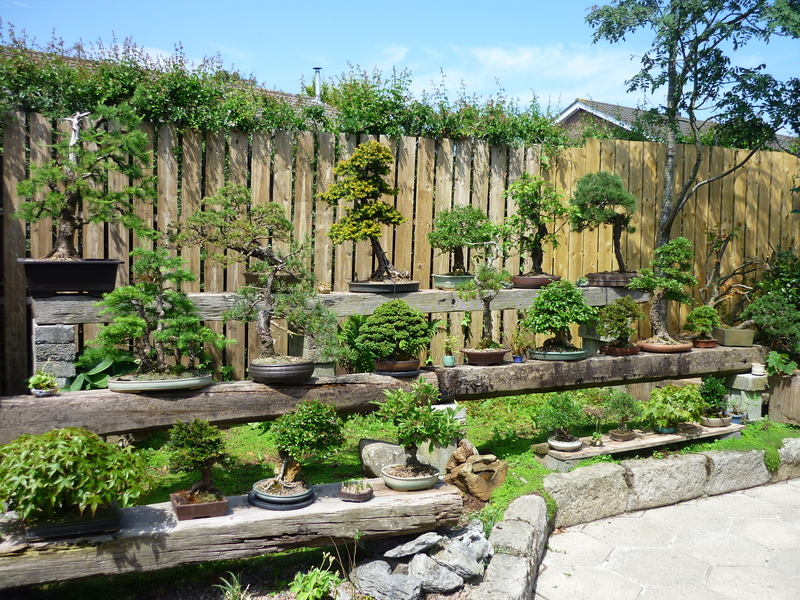 But before you do, why not read this item by Graham Potter of Kaisan Bonsai ? It was first posted in 2014 but has recently been re-posted which is not surprising as it is the best article I have seen on the subject - a must read! I spent a very interesting and informative evening last night with the West Lothian group who had invited Ian Bailiie to come along with some of his pots and give us some insight into the pot-making and the pot choosing process. Ian as a founder member of the SBA was able to interlace all that information with interesting snippets from the history of the Association which somehow gave me a better appreciation of the past efforts to establish and develop the organisation. Ian also brought along some of his trees to illustarate the principles behind matching trees to pots in terms of size, shape, colour and the masculine/feminine nature of the tree in question. All in all a good night attended by several members from other clubs. I am sure that even more members would have been interested if they had known about it - another good reason to keep local club events and programmes up to date on teh web ! Thanks Lee for organizing and thanks to West Lothian for hosting. You should be aware by now that the Peter Warren week-end will take place on September 16/17th this year. Saturday will be a demo for all and Sunday will be a workshop for just 6 or 7 people. If you want to be part of the workshop day (cost probably £50) then you need to let your convener know at your upcoming meetings as we will need to organise a suitable venue depending upon where participants are based. Any questions - just mail me at the above address. Hi All. I have attached a copy of the Jan/Feb Newsletter for FOBS (Federation of British Bonsai). Of main interest is the inclusion of the calendar of events for shows/exhibitions etc. This would normally be included in the SBA Newsletter but until we have a volunteer to edit the newsletter I will endeavour to publish up to date versions here. If you could be interested in volunteering please let me know - or contact Mike Rossi mikerossi@blueyonder.co.uk for info on what is involved. The first post of 2017 – so Happy New Year everyone ! We kicked off the year with the 2017 Winter Image Event hosted by the Ayrshire Group. This was held in a local hotel this year while remedial work was being carried out on our normal venue at Alloway Village Hall. That didn’t stop a record turnout for the event with more than 50 people attending not just from Scottish clubs but also from further afield (Carlisle) and from local members of the public inquisitive to see what was going on in the public rooms we had hired. This is meant to be an informal event to show and discuss trees in their winter garb i.e. no fancy displays, backcloths etc. and, as such, has been very successful and has grown from strength to strength over the four years it has been going. The hotel management bent over backwards to make sure that we had everything needed to make the event a success and the general view from participants was that it was the best yet. But we can always improve. The hotel lighting and backdrops were not ideal, particularly for those wanting to take good quality photos but next year we should be back in a more suitable venue and will be looking to improve those aspects and add a few other improvements. So, thanks to all those who attended and supported the event and to those who generously made a donation towards the cost of the event. Without our members support and enthusiasm for the event it would never be so successful. 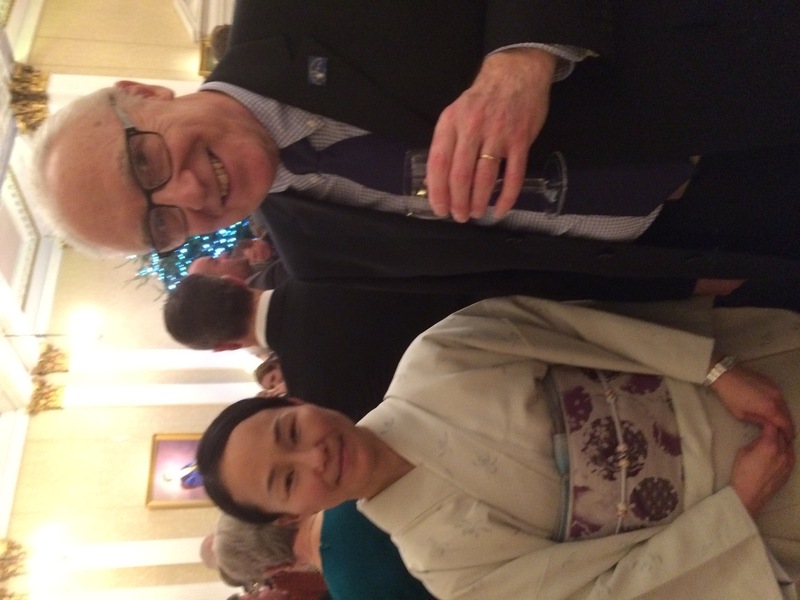 Each year the SBA President receives an invitation to a reception celebrating the birthday of the Japanese Emperor. This year I attended for the first time at the Merchants' Hall in Edinburgh. The event attracts a mixed crowd of diplomats, artists, musicians and hobbyists like ourselves. Apart from a couple of formal speeches there was an exhibition of Ikebana and ssome entertainment from a choir. Although the event provides a chance to maintain and maybe increase the profile of the hobby I cannot claim any great achievement on that front - being the shy, retiring (and some would say undiplomatic !) person that I am. However, I did manage a few words with the Consul (Mr. Matsunaga) and his wife, who expressed some enthusiasm about being able to attend our next National Exhibition. This isn't a definite yet but we hope to be able to confirm their attendance nearer the date. In the meantime I also managed to catch up with the Cultural Attachee (Ms. Yoko Murata) as you can see in the attached photo - I am the one on the right ! 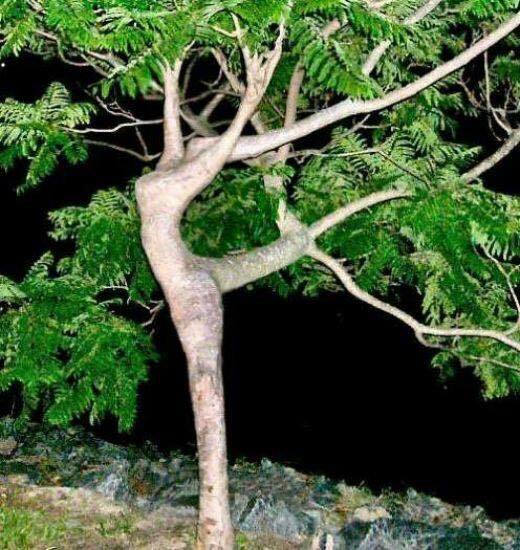 Getting too cold to be outside messing about with trees ? How about a fireside read of this pot-stirring article sent to me by one of our members ? Contentious views or scientifically based fact - what do you think? Autumn brings, amongst other things, a last chance to clean algae off trunks, branches and deadwood before putting bonsai in their winter protection positions. For years I have used a dilute solution of vinegar, roughly at 1:20, and gentle rubbing with an old toothbrush (much more concentrated solutions will kill the foliage). This cleaning is, happily, far easier on less developed trees providing that their twigs or bark are not too delicate. But for deciduous trees with denser twigging, conifers with denser foliage pads (such as junipers), and old trees with flaking bark this method can’t do the complete job without potential damage to the tree. Tony Tickle, in his talk in Perth last year, said he used a dilute salt solution, but I can’t remember if he suggested spraying or not. Do you have any recommendations for this essential cleaning job? Reply from Jeff Banning : All the references I have seen to moss/algae removal have been the “teaspoon of vinegar to litre of water" solution (this has come up on Wee Trees and Internet Bonsai sites in the past). Or the alternative recommendation is Kaizans’ algae removal stuff. To be honest I have never seen a reference to using salt solution and don’t recall that being discussed with Tony Tickle. Our club has bought a tree cleaning machine which most who have used it seem to think is quite successful. They are expensive though (we paid about £130) but, as I am lucky and don’t get much in the way of moss or algae on my trunks or branches, I have never used it. This site gives details of the machine which is not designed specifically for tree cleaning purposes but its' adjustable spray power makes it ideal and several other SBA members do have one. Are you someone like me who struggles with the "vision thing" and who has been unable to get bonsai experts to articulate the process of discerning and arriving at an image. Well this piece by Andy Rutledge may help. It's been around since 2013 so some of you will probably know it but it's a new discovery for me and I did find that his way of approaching the subject gave a few new insights. Something to read on these long dark nights! PS : I have created a new section in the A to Z covering books and articles that may be of interest. I don't plan to log every bonsai book in the business but I am looking for recommendations by people who found a particular book interesting or helpful. All inputs welcome - go on, surprise me !! At our Committee meeting last Sunday we agreed to invite Peter Warren to Scotland for 2 days next year. After an exchange of available dates between us the Committee agreed on September 16th & 17th (Saturday & Sunday) as the best available dates and Peter Warren has confirmed that these dates have been entered into his diary. At this stage we envisage a Saturday presentation at The Smith Museum and Art Gallery (the same as last year) followed by a workshop on the Sunday for 6 or 7 people. The intention is that the workshop will be held somewhere convenient for those wishing to attend, recognising that we could have attendees from several different areas. We still have to iron out the details but the workshops are likely to cost £50. The action now is for you to provide your Convener with expressions of interest in both events, so we can start to plan in a little more detail. Drop me a mail at president@scottishbonsai.org if you have any questions or issues. 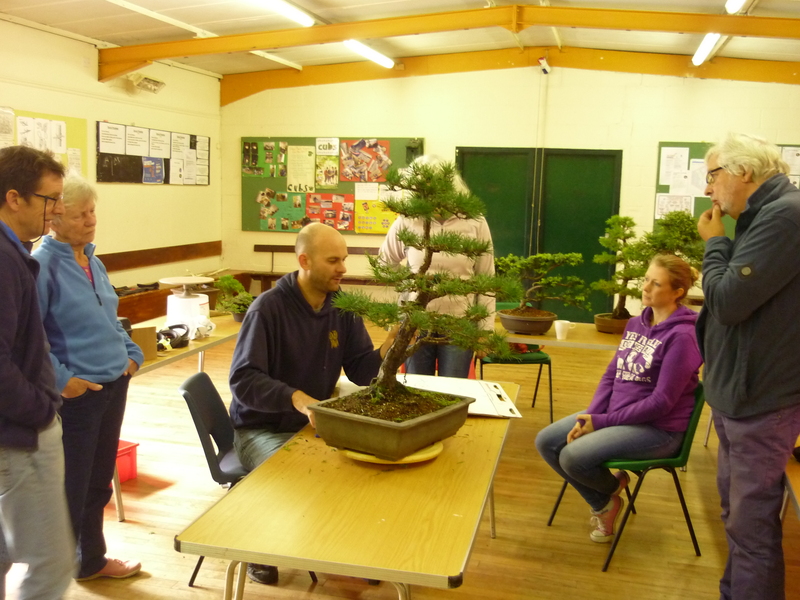 On Sunday 6th at The Broompark Centre in Denny, we held our first SBA Bonsai Boot Sale. This proved a great success with many trees, pots, stands and other bonsai paraphernalia changing hands at bargain prices. It was a busy day as there was a Committee Meeting in the morning and we also held our AGM Meeting midway through the afternoon with Marion and the team once again providing an appetising lunch spread (thanks once again ladies). Because it was so busy I didn’t manage to take the photos I intended but I did grab a few towards the end of the session just to give an idea of the sort of items that were on sale. See these in our next newsletter. Thanks to all who brought items to sell and to all those who bought items from the sale – it was you who made this a successful first venture. We will definitely repeat the exercise next year. At last years AGM it was agreed that preliminary accounts (subject to audit) would be circulated prior to the AGM in order to allow people to have time to review them before the meeting. Unfortuntely there have been some problems with the webistes mailing system which have meant that the mail sent out by the Secretary has not got through to everyone. I have therefore uploaded the accounts file here so that members can access it. I apologise for the delay in getting this information to you all but we only recently realised that there was mailing issue preventing the communication getting through. Just a quick reminder that memberships are due for renewal by the end of October and only members with up to date membership are eligible to vote on motions at our AGM on the 6th November ! If you send me your before and afters I will endeavour to publish them here. Many members expressed a desire to see more of this sort of thing, so here's your chance. I'm back, after a great holiday in Canada and Alaska, with lots of time marvelling at the trees in that region and how many of them seem to grow out of solid rock! I am now looking forward to the AGM on 6th November and in particular our first Bonsai Boot Sale. If you want to buy, sell, swap anything bonsai make sure that you come along. As an added bonus you also get to throw rotten tomatoes (only figuratively !) at the SBA Committee or maybe even shower them with praise (literally) - it's up to you. I am looking forward to a good turnout so we can continue our efforts to make the SBA as relevant as possible to its members. Please note the changes to arrangements for the Bonsai Boot Sale in November. The sale will take place in the main hall of the Broompark Centre, Denny, starting at 1pm and continue till the end of the afternoon (up to 5pm). There will be (some) food available in the small hall from 1pm following the morning’s committee meeting, as usual, for committee members and those who have made a long journey to attend the AGM. There will be a break for the AGM from 2pm to approximately 4pm. All members are invited to buy and sell any bonsai related items: pots, trees, display tables, accent plants, scrolls etc. Tables to display items will be laid out around the hall. Each item should be clearly labelled with the price and the name of the seller. All transactions will be between individual buyers and sellers. Cost would be payable on delivery. PS : If you want a fleece embroidered then, at teh moment, this can be done if you want to provide the fleece. The same route applies - i.e. through your Convener. As Convener of the Ayrshire Group I would like to invite everyone interested to enter into the bonsai competition at this years’ Ayr Flower Show. 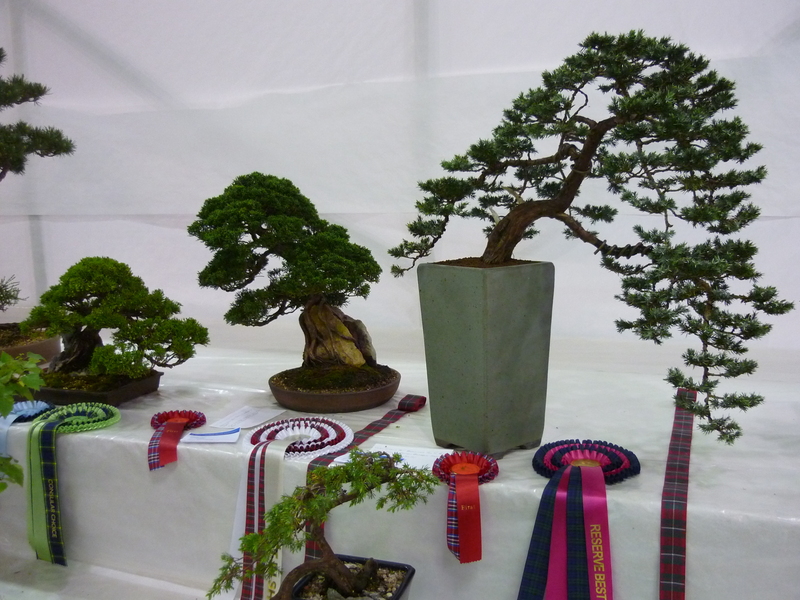 The Ayrshire Bonsai Group will occupy a significant area for both a club display in addition to the extensive competition section. We invite all enthusiasts from Scotland and the North of England to consider entering the competition which is open to all comers – including novices. Up to 5 trees may be entered for a fee of £6 and any number above 6 for £11. Entrants are entitled to a free day pass worth £15. Entry forms should be submitted by Friday 31st July. Following the requests made by respondents to our recent member survey, this week's SBA Committee meeting confirmed our intention to hold a Bonsai Boot Sale on Sunday November 6th at the Broompark Community Hall in Denny. This is the same date and venue at which we will be holding our 2016 AGM. This will run from 10.00 until approximately 15.00 and all members are invited to present items for sale including trees, pots, display tables, accent plants etc. A contribution of 10% towards SBA funds would be deducted and the proceeds distributed to sellers. If you have any questions or views about the arrangements please let your Convener know - or you can contact me on the above address. If you wish to advertise any items that you will be intending to bring you can always upload details onto our For Sale page. There were also several inputs to the member survey suggesting that the website could be improved by being developed as a more inter-active forum. I am trying to use this Prseidents Page for that as a sort of trial. So, any comments, suggestions, questions on this or any other subject can be opened up to members on this page. I hope you will feel motivated to contribute. The Japanese art of Bonsai was actually a practice originated in China and most of the bonsai trees were grown not to impress aesthetically and create a beautiful overall sight, but to help the owners of bonsai trees in meditation. Various schools of Buddhism found the art of Bonsai to be one of the most relaxing and stress reducing activity. Growing and caring for bonsai trees is a relaxing and beautiful hobby that will help you forget day by day stress. Take a breath after a hard day work, water your bonsai plant and groom it here and there. I promise you will feel better! Bonsai trees need love too! It sounds silly, but besides trimming, fertilizing, and watering they also need a peaceful environment. You won’t create a peaceful environment only for the bonsai tree, you will create it for your self as well. Working with nature, bonsai trees included, you will work on your patience. Indoor bonsai, and other plants in general, will keep the air purified and fresh. Having a healthy bonsai tree next to your bed can help you get over your cold faster, help with you coughs and sore throat by constantly refreshing the air you breath. Each day growing a bonsai tree will keep you at peace with yourself, rewarding you with a great sense of accomplishment that will definitely have a positive impact on your health. Comments, queries, suggested actions are all welcome . First things first - congratulations to all the members who supported the SBA's displays and competition at Gardening Scotland. Two gold medals at a flower show is a tremendous achievement. This is a lot of effort for a lot of people who deserve great credit when it comes together successfully. Now we just have to work out what to do next year. Congratulations also to the Ayrshire Club whose display was awarded Best in Show and Best Newcomer awards. Speaking personally it was a lot of work and a lot of driving to and fro but it proved worth it in the end. Can we repeat it next year ? I don't know - we are all feeling pretty knackered at the moment and just need some time to recover ! One other point on my gardenia issue. You may remember that I was struggling with a lot of yellowing and dropping leaves from my shohin sized tree and had tried several things without success. Well, after talking it through with Sauro Biondi and Ian baillie (to name just a few) I discovered the remedy - acid soil. Obviously I had the pH level totally wrong so instead of trying to raise it by adding stuff I decided to repot in ericaceous compost and water with a very weak solution of water and white vinegar and hey presto the plant is looking great. It just goes to show how important pH levels can be, and suffice to say, I will be paying a lot more attention to this aspect in future. Do you have a problem which you would like to share (bonsai issues only please !!). Then why not send it to president@scottishbonsai.org - you never know, somebody out there might have a solution. The end of May is rushing at us, and with it the Gardening Scotland Event. The SBA are going all out to organise a good show of trees and as many entries as possibkle for the competitive section - so I hope that all your trees are in order and you are getting ready to enter ! Flowering on Pine is not good as it will leave a stalk of bare branch before the needle. If you have one long flower candle and one short then remove the larger, this will keep the foliage tighter. If you only have large flowering candles then tip the end of the candle and leave some needle so it will back bud, then remove the whole candle. Pines flower more if they are pot bound and if you give them high potassium fertiliser. Our soft water has a ph of about 7.0 i.e. neutral. Gardenias (along with some others like azalea) , tend to do better in slightly acidic soil. So how do I safely add acidity to my plant if our water does not provide the answer ? I believe that there are products at garden centres, but a cheap alternative I heard about is : coffee grounds - mixed into the soil, sprinkled on top, or poured on. You can also make a soil drench by soaking 1 cup of coffee grounds in a 1 gallon of water., leaving for 2 or 3 days then using to water the plant. For faster action, you may add add a few tablespoons of vinegar to the next watering. Adding sphagnum can also lower the pH of the soil. Well what a busy couple of weeks it's been. First a very successful visit by Peter Warren who held everyone's attentionfor several hours at Smith Museum and Art Gallery with a wide ranging discourse on all aspects of bonsai, which included a critique of all the trees brought along by members. This was followed by two workshops, one for seven people at Ayra nd another for eight at Fankerton. Everyone who participated seemed really pleased with the sessions and went home a lot wiser - and with some significantly improved trees. This was followed by our national Exhibition in Stirling. The event went off very successfully thanks to the expert organisational skills of John Morris and other members of the Forth Valley Group. Thank you guys for a great day. This event always takes a lot of preparation by all clubs to put on a good display. Lanark won the award for best stand but I must confess that my eye was taken by the Perth Groups presentation because, yet again, it was a different display format from previous years. Many of us tend to exhibit in teh same or similar format every year but Perth always have a different presentation each year - great to see. Just a quick update regarding the Peter Warren event on Saturday at Smith Museum and Art Gallery in Stirling. We will kick-off at 10.00 and break for lunch at 13.00. Ticketholders should present their ticket to obtain lunch. We will aim for comfort breaks at 11.30 and 15.30. Tea/coffee will be available from the kitchen adjacent to the lecture hall. For those of you who have completed and submitted the Survey Form, we will be drawing the prize winner of the £25 Wattston Bonsai Gift Voucher on the day. We aim to finish by 17.00. By all means bring a tree along for review or advice. We cannot guarantee that every tree will be selected but it will be helpful to have a good selection of trees available to use as illustrations if needed. Make sure you have all your questions ready that you want to ask. The session is intended to be very inter-active so the more questions the better. If you want to use a picture to support a question or to make a point then just send to me and I will put it on a memory stick so we can flash up on the screen if needed. I hope that covers everything – see you all there. It’s almost mid-April already and we have a very busy time ahead of us. The 3 day visit by Peter Warren takes place from 30th April to 2nd May, during which time he will conduct a presentation/discussion sharing his experience and expertise in the hobby, followed by two one day workshops in Alloway and Fankerton. This is closely followed by our National Exhibition to be held in The Mayfield Centre near Stirling on Saturday 14th May. Then following close on its heels is Gardening Scotland on the 3rd, 4th and 5th of June, where the SBA and the National Collection will use a large display area to exhibit some of our best trees. 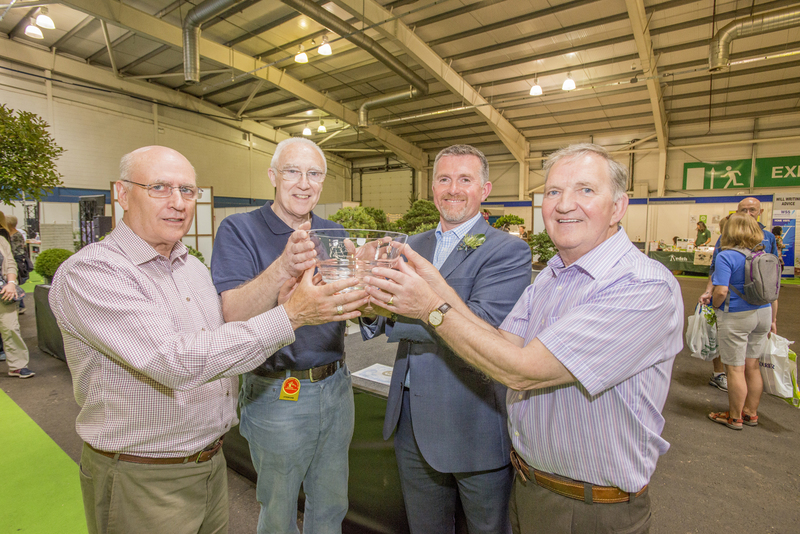 Also this year the Ayrshire Club has been invited by the organisers of Gardening Scotland to reprise its display at the Ayr Flower Show last year. So, just at the time when our trees are demanding more of our time and attention we have a stream of very busy events to manage. This is a key time for us to publicize the hobby in Scotland and is taking up a lot of volunteers time and effort to make a success – so I want to say thanks in advance to all those involved. Well now it’s getting towards the end of the month and I wanted to update you on my trip to Willowbog last Friday to attend a Peter Warren workshop. One of the things that struck me most is the loyalty to Peter’s workshops shown by the fact that most attendees are regulars. Of seven attendees on the Friday I was the only one who did not come regularly and several of the group had booked for more than one day. I was followed on Saturday and Sunday by Dave Waddington (Penicuik) and Janice Edwards (Edinburgh) who, I understand, are already booked for two days with Peter in June and again in September. And they aren’t the only ones who travel a significant distance to work with Peter. The format I found to be very helpful as Peter did not try to style my trees, rather his advice was more holistic covering styling, maintenance and development. He certainly answered several questions about the trees I took and made me much more comfortable that I was going down the right road. We still have some places available on Peter’s workshop on Monday 2nd May at Fankerton so why not sign-up either via your Convener or direct to myself. You know you’re worth it ! I can’t believe it – we are one third of the way through March already and it looks like Spring is tentatively popping its head above the horizon. This is a busy time for bonsai but also fraught with danger for the impetuous amongst us, so why not take a look at the Bonsai Calendar page on our website for some useful tips and advice. The Peter Warren event is approaching fast and it is important that we know who wants to attend which day, so please make sure that your Convener knows your requirements so we can get organised. I am attending a Peter Warren workshop down at Willowbog on the 18th March so hope to discuss more details with Peter while I am there. It would be great to have a firm idea of numbers by then. I hope to give you all a report when I get back. For those of you who refer to the AtoZ of Bonsai on our web page, you will notice that some entries do not have suitable pictures with them. If you have some good pictures which would fill in some of the blanks why not send them along to atozeditor@scottishbonsai.org . This would be a big help , and remember, that this section of our web page, perhaps more than any other, impacts the reputation of the hobby in Scotland. The Peter Warren 3 day event is coming up. Please make sure you let your convener know which day you want to participate in. This is being heavily subsidised out of SBA funds and is a big financial commitment on behalf of the members so please support the initiative. You can see details in the latest Newsletter. Can it be more than 18 months ago that we set up the AtoZ of Bonsai on our site. A one stop shop with links to every aspect of bonsai that you can probably think of. This is meant to be a composite of all our members knowledge so if you see that a subject is missing or that the information is innaccurate or incomplete just write to the editor via the link on teh AtoZ page. Come on - get involved! We are considering a member "bonsai boot sale" later in the year so discuss it at your club meetings - let your conveners know if you would want to participate and any ideas you have about it. This would be an ideal opportunity for you to swap, buy, sell any surplus you have. I want to take this opportunity to wish all the members a Happy New Year for 2016 and hope that all of your bonsai wishes come true (just the reasonable, achievable ones anyway !). If any of you, like me, received very welcome bonsai gifts in your Christmas stocking, I hope that you make good use and derive great enjoyment from them over the next 12 months. Personally, one of the best presents I received was a book entitled : “Penjing : The Chineses Art of Bonsai by Zhao Qingquan. Apart from the usual practical content, along with some great pictures, the most interesting element of the book is the focus on the spirit, or essence, of bonsai. "To achieve this goal, rather than to strive for a photographic reproduction of a natural scene, the artists needs to maintain a balance between dominance and subordination, emptiness (void) and substance, denseness and sparseness, highness and lowness, largeness and smallness, life and death, dynamics and statics, roughness and meticulousness, firmness and gentleness, lightness and darkness, straightness and curviness, verticality and horizontality and lightness and heaviness. The main task of the artist is to balance varied forces against each other to attain equilibrium." So, if you thought the design process was a bit tricky before, now you know why ! I don’t know about all you guys out there but I did find this very helpful in helping me to get my head around the design process – especially when Mr. Qingquan expands on each of the above mentioned aspects in his book. Translating it into action is of course quite a different thing but I hope that it may give you (as it did me) a different and interesting insight into how to view the whole process. We have an interesting year ahead of us in 2016 with the three day Peter Warren visit adding to our normal curriculum of meetings, shows and events. I hope that you enjoy them all and feel free offer your own input about what you would like the SBA to deliver for its members in this and subsequent years. The Finnis Scott Foundation was established under the Will of Lady Montagu Douglas Scott (Valerie Finnis) in 2006. The Trustees can make grants for any charitable purpose, but their present policy is to focus grant-making in the areas of horticulture and plant sciences, as well as fine art and art history.